(a) The air conditioning system has the following controls. This control is capable of performing complex control by artificially simulating the information processing method of the nervous system of living organisms in order to establish a complex input/output relationship similar to that of a human brain. Based on the temperature set by the temperature control dial, the neural network control calculates outlet air temperature based on input signals from various sensors. The temperature settings for the driver and front passenger are controlled independently in order to provide separate vehicle interior temperatures for the right and left sides of the vehicle. Thus, air conditioning that accommodates the occupants' preferences has been realized. Controls the blower motor in accordance with the airflow volume that has been calculated by the neural network control based on the input signals from various sensors. Automatically switches the air outlets in accordance with the outlet mode that has been calculated by the neural network control. In accordance with the engine coolant temperature, ambient air temperature, amount of sunlight, required blower, outlet temperature, and vehicle speed conditions, this control automatically switches the blower outlet to foot and defroster mode to prevent the windows from becoming fogged up when the ambient air temperature is low. Automatically controls the air inlet control damper to help achieve the calculated outlet air temperature that is required. Drives the air inlet control servo motor according to the operation of the air inlet control switch and moves the dampers to the fresh or recirculation position. Through the calculation of the target evaporator temperature based on various sensor signals, the air conditioning amplifier optimally controls discharge capacity by regulating the opening extent of the compressor solenoid valve. 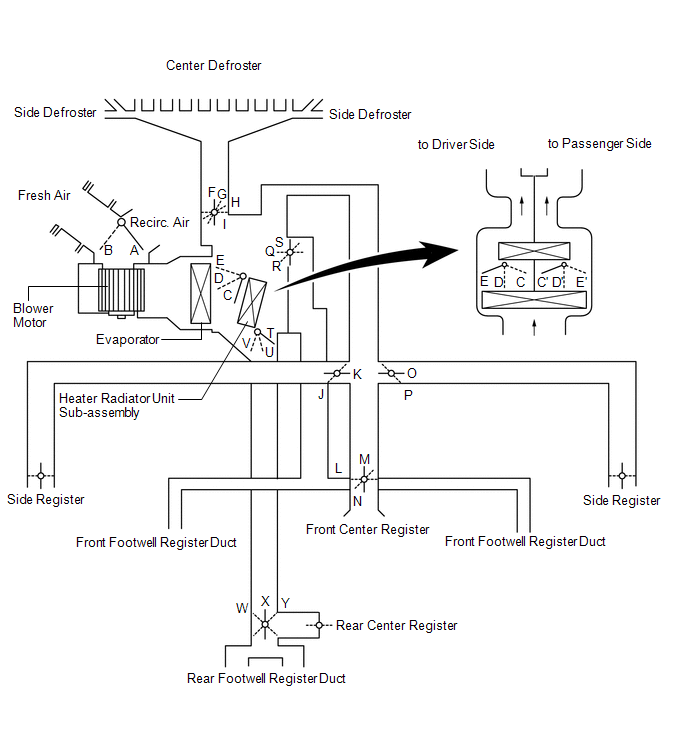 Defroster control logic is used to improve defroster performance. A DTC (Diagnostic Trouble Code) is stored in the memory when the air conditioning amplifier detects a problem with the air conditioning system. 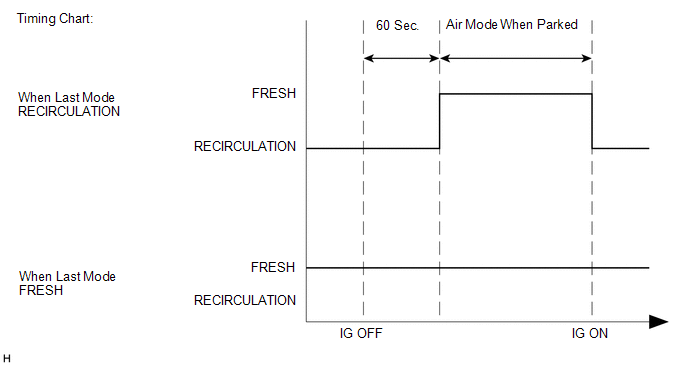 In the previous automatic air conditioning systems, the A/C amplifier determined the required outlet air temperature and blower air volume in accordance with the calculation formula that has been obtained based on information received from the sensors. However, because the senses of a person are rather complex, a given temperature is sensed differently, depending on the environment in which the person is situated. For example, a given amount of solar radiation can feel comfortably warm in a cold climate, or extremely uncomfortable in a hot climate. Therefore, as a technique for effecting a higher level of control, a neural network has been adopted in the automatic air conditioning system. With this technique, the data that has been collected under varying environmental conditions is stored in the A/C amplifier. The A/C amplifier can then effect control to provide enhanced air conditioning comfort. 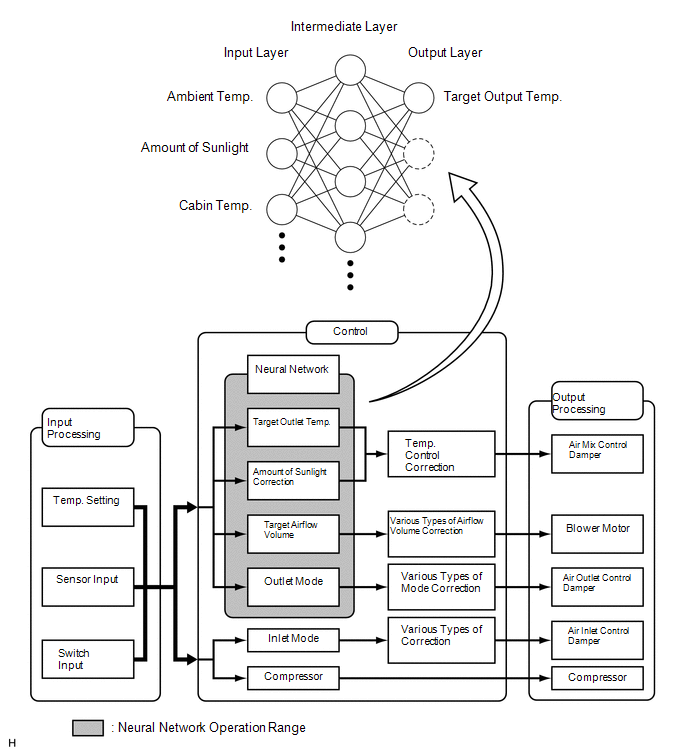 The neural network control consists of neurons in the input layer, intermediate layer and output layer. The input layer neurons process the input data of the outside temperature, the amount of sunlight and the room temperature based on the outputs of the switches and sensors, and output them to the intermediate layer neurons. Based on this data, the intermediate layer neurons adjust the strength of the links among the neurons. The sum of these is then calculated by the output layer neurons in the form of the required outlet temperature, solar correction, target airflow volume and outlet mode control volume. Accordingly, the A/C amplifier controls the servo motors and blower motor in accordance with the control volumes that have been calculated by the neural network control. Allows fresh air to enter. Causes internal air to recirculate. Varies the mixture ratio of warm air and cool air in order to regulate the temperature continuously between hot and cold. Defrosts the windshield through the center defroster, side defroster, quarter defroster and side register ducts. 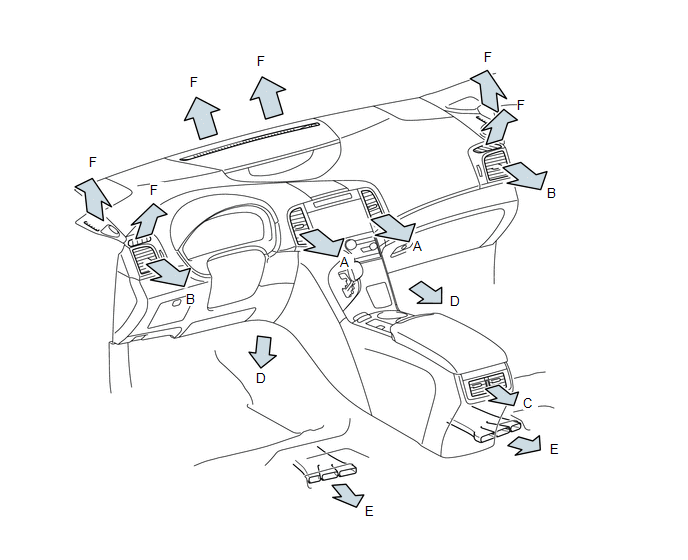 Defrosts the windshield through the center defroster, side defroster, quarter defroster, side register, and rear center register ducts, while air is also blown out from the front and rear footwell register ducts. Air blows out of the footwell register, rear center register and side register ducts. In addition, air blows out slightly from the center defroster and side defroster. Air blows out of the front and rear center register, side register and front and rear footwell register ducts. Air blows out of the front center register, rear center register, and side register ducts. The size of each circle ○ indicates the ratio of airflow volume. When the vehicle is parked, the air conditioning unit uses control logic which automatically changes the air inlet to FRESH mode to purge undesired odors from the air conditioning unit. This logic will therefore reduce undesired odors upon starting the air conditioning system. (1) The A/C compressor is a continuously variable capacity type in which its capacity can be varied in accordance with the cooling load of the air conditioning system. (2) The compressor consists of the A/C pulley, shaft, lug plate, swash plate, piston, shoe, crank chamber, cylinder and solenoid valve. (4) A solenoid valve that is provided to enable the suction pressure to be controlled as desired. (5) The internal valve is provided to improve the A/C compressor durability under the high speed and large thermal load conditions. The internal valve is integrated into the solenoid valve. (1) The crank chamber is connected to the suction passage. A solenoid valve is provided between the suction passage (low pressure) and the discharge passage (high pressure). (2) The solenoid valve operates under duty cycle control in accordance with the signals from A/C amplifier. (3) When the solenoid valve closes (solenoid coil is energized), a difference in pressure is created and the pressure in the crank chamber decreases. Then, the pressure that is applied to the right side of the piston becomes greater than the pressure that is applied to the left side of the piston. This compresses the spring and tilts the swash plate. As a result, the piston stroke increases and the discharge capacity also increases. (4) When the solenoid valve opens (solenoid coil is not energized), the difference in pressure disappears. Then, the pressure that is applied to the left side of the piston becomes the same as the pressure that is applied to the right side of the piston. Thus, the spring elongates and eliminates the tilt of the swash plate. As a result, there is no piston stroke, and the discharge capacity is reduced. (1) The internal valve operates when the A/C compressor speed has increased rapidly, the A/C compressor speed is high, or when thermal load has suddenly changed. As a result, the A/C compressor capacity is reduced and the durability of the A/C compressor increases. The A/C lock sensor sends A/C pulley speed signals to the A/C amplifier. The A/C amplifier determines whether the A/C compressor is locked or not by using those signals and engine speed signals. The evaporator temperature sensor detects the temperature of the cool air immediately through the evaporator in the form of resistance changes, and outputs it to the A/C amplifier. The blower motor has a built-in blower controller, and is controlled using duty control performed by the A/C amplifier. (a) A BUS connector is used in the wire harness connection that connects the servo motor from the A/C amplifier. 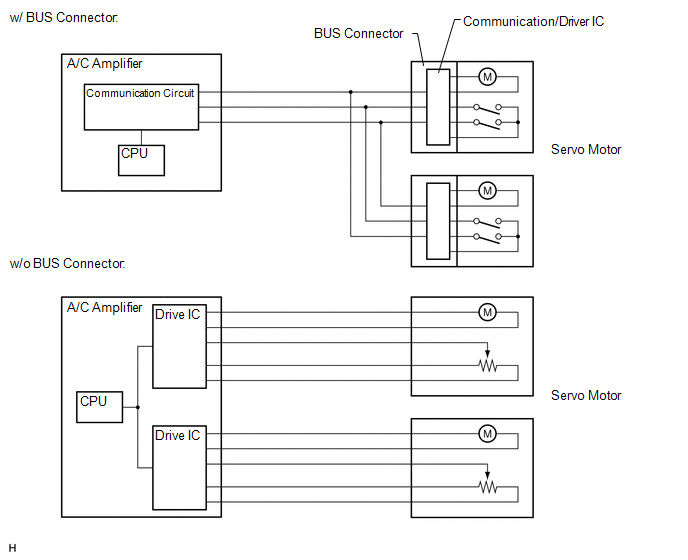 (b) Each BUS connector has a built-in communication/driver IC which communicates with each servo motor connector, actuates the servo motor, and has a position detection function. This enables bus communication for the servo motor wire harness, for a more lightweight construction and a reduced number of wires. 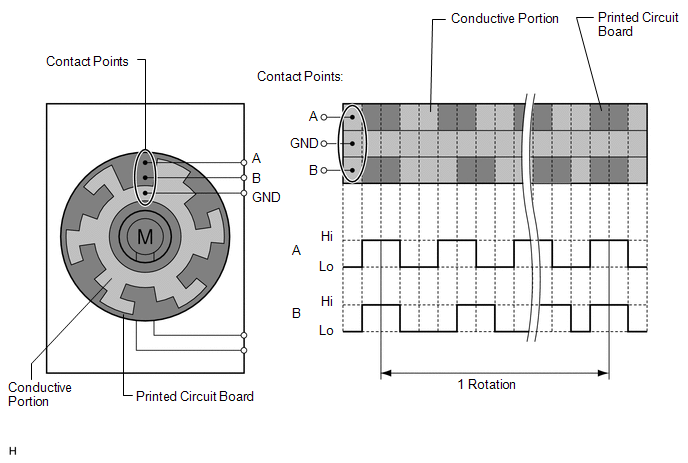 The pulse pattern type servo motor consists of a printed circuit board and a servo motor. The printed circuit board has three contact points, and can transmit two ON-OFF signals to the A/C amplifier based on the difference of the pulse phases. 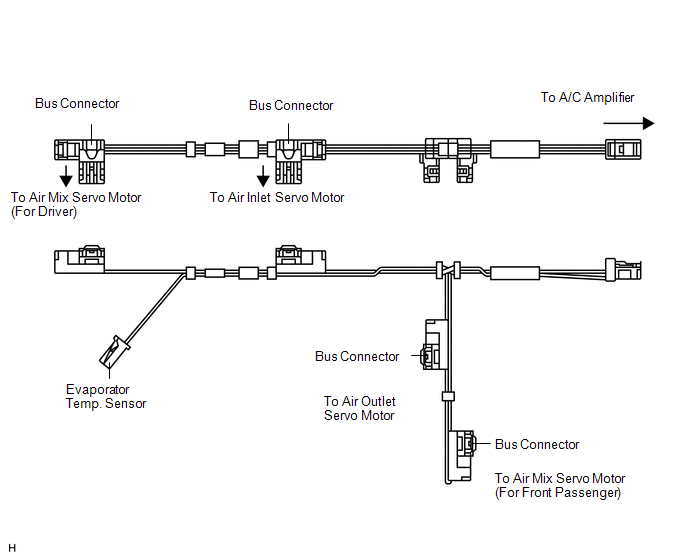 The BUS connector can detect the damper position and movement direction with this signal. The room temperature sensor detects the cabin temperature based on changes in the resistance of its built-in thermistor and sends a signal to the A/C amplifier. The ambient temperature sensor detects the outside temperature based on changes in the resistance of its built-in thermistor and sends a signal to the A/C amplifier. 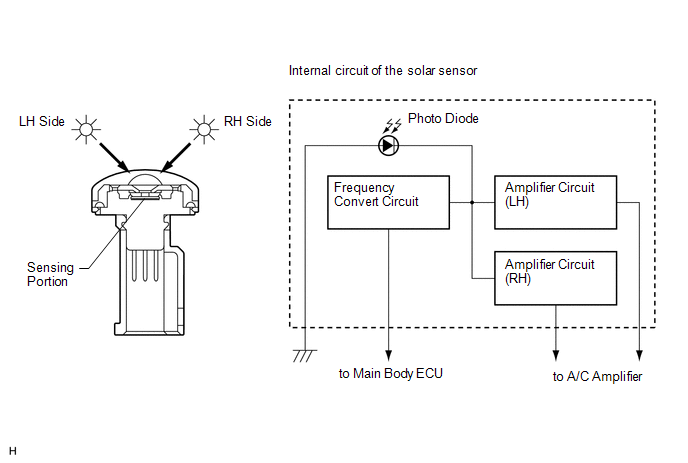 (a) The solar sensor consists of a photo diode, two amplifier circuits for the solar sensor, and frequency converter circuit for the light control sensor. (b) The solar sensor detects (in the form of changes in the current that flows through the built-in photo diode) the changes in the amount of sunlight from the LH and RH sides (2 directions) and outputs these sunlight strength signals to the A/C amplifier. The A/C pressure sensor detects the refrigerant pressure and outputs it to the A/C amplifier in the form of voltage changes.